I hate doing this, but this is a once in a lifetime experience, so please bear with me as I brag just a little bit. My CEO at EMI was kind enough about four weeks ago to nominate me for a feature being run in Billboard Magazine for their annual “30 Under 30” feature, and believe it or not I was chosen! Yeah, that Billboard Magazine – crazy… way crazy. The article features, as they say “30 young rising executives in the music industry from all aspects of the business….” I don’t know if I’m really “rising executive” material, but it was cool to be placed in this bunch. The feature ran in this week’s edition of Billboard (8/24). So it features everyone from the CEO of Imeem to one of Live Nation’s head talent agents, to the creator of Facebook. 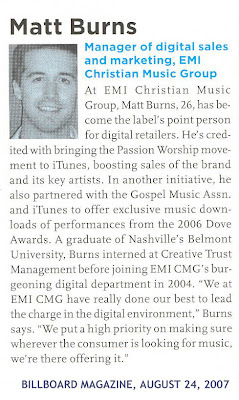 I was chosen specifically because I am the account manager for iTunes while representing the largest Christian music company in the industry, and we’ve done a significant amount of work, specifically at iTunes, getting Christian music to a place where it is quite successful in the digital space. Here’s where I need to throw out the qualifier that this stuff is a team effort and I’m given the chance to take credit for a lot of things I had a lot of help on. But it has been fun being around through the beginning of this whole thing… I was working iTunes over three years ago when hardly anyone knew what an iPod was and it was a struggle every week just to make sure our albums went live. So, there you go. I really never thought I would be quoted in a national magazine. I got to be a quasi-celebrity for a week. Back to normal tomorrow. You need to check this out… seriously…..
On Sunday afternoon I finally got to experience the epic conclusion to the Bourne series, The Bourne Ultimatum, an event that has been five years in the making for me. I’ll get in trouble if I call “Bourne” the greatest movies of all time, but they are personal favorites for me… in a Top 6 list, the three movies in the series place within it. The Bourne movies have been wonderfully constructed, portraying a secret agent in a way that hasn’t been done before – heroic within reason, clever beyond imagination, and tortured by his own capabilities. They are paced ever so well with the perfect balance of storyline, suspense, and action – not too much or too little in any respect. I was so happy with the way Bourne Ultimatum tied things together: First, the overlay of time / events between Supremacy and Ultimatum was clever, and I hadn’t expected that… I figured it would pick up right where Supremacy left off, but it actually went back in time and filled in events for six weeks prior. The Bourne movies have become known for their car chase scenes – the first movie pushed an old Mini Cooper to it’s limit, and the second absolutely destroyed a Moscow taxi-cab. I like how they did the chases in the third one though – a lot of “foot” chases, with Bourne using clever tactics to elude those who were pursuing him by using his seeminly inborn agent abilities. And towards the end of the movie, seeing him tear up New York City in a cop car was fantastic. I loved the ending – it was perfect, and I couldn’t have hoped for anything better. It filled in just enough gaps to leave you satisfied, yet at the same time kept you wondering a bit… what’s next? There’s lots of talk about whether or not there will be a 4th movie, and I personally hope there isn’t (from an artistic perspective). It ended dramatically answering the big question of whether or not Bourne was alive or dead, and immediatly went to credits with Moby’s song “Extreme Ways”… but unlike the other movies, Moby did a remix of the song for this movie that seemed to say “this is the end… Bourne is finished now”. Plus the end credits were artistically dramatically different which I felt also indicated a definitive end to the series. All in all, I am so satisfied and relieved that the directors / producers took such care in executing an artisically brilliant action movie, something that in and of itself rarely happens. The movie I highly recommend (as a theater must-see), and if you’re behind on the series as a whole, now is the time to get up to speed!